In ancient Egypt, the power of the god Amun of Thebes gradually increased during the early New Kingdom, and after the short persecution led by Akhenaten, it rose to its apex. In the reign of Ramesses III, more than two thirds of the property owned by the temples belonged to Amun, evidenced by the stupendous buildings at Karnak. Although badly ruined, no site in Egypt is more impressive than Karnak. It is the largest temple complex ever built by man, and represents the combined achievement of many generations of ancient builders. The Temple of Karnak is actually three main temples, smaller enclosed temples, and several outer temples located about three kilometers north of Luxor, Egypt situated on 100 ha (247 acres) of land. Karnak is actually the sites modern name. Its ancient name was Ipet-isut, meaning "The Most Select (or Sacred) of Places". This vast complex was built and enlarged over a thirteen hundred year period. The three main temples of Mut, Montu and Amun are enclosed by enormous brick walls. The Open Air Museum is located to the north of the first courtyard, across from the Sacred Lake. 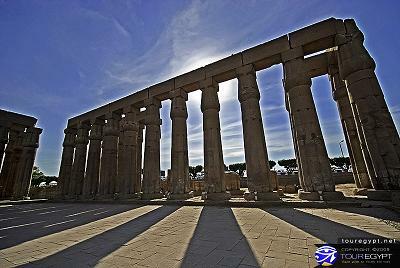 The main complex, The Temple of Amun, is situated in the center of the entire complex. The Temple of Monthu is to the north of the Temple of Amun, and next to it, on the inside of the enclosure wall is the Temple of Ptah, while the Temple of Mut is to the south. 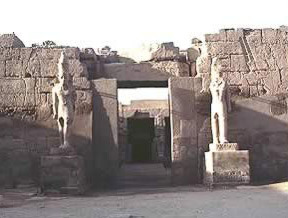 There is also the small Temple dedicated to Khonsu, and next to it, an even smaller Temple of Opet. Actually, there are a number of smaller temples and chapels spread about Karnak, such as the Temple of Osiris Hek-Djet (Heqadjet), which is actually inside the enclosure wall of the Temple of Amun. In theGreat Temple of Amun, the Second Pylon of Karnak was built byRamesses II. ThePtolemies did some extensive repairing and some new building on the center section. Curiously enough, they left the columns and the facade of the First Pylon unfinished and left the mud-brick ramp where it was at. The reason for the work being left unfinished is not clear. The Hypostyle Hall is found after passing through the Second Pylon. The hall is considered to be one of the world's greatest architectural masterpieces. Construction began duringRamesses I's reign. He was the king who founded the Nineteenth Dynasty and was king for only one year. The work continued underSeti I (1306 - 1290 BC). Seti I also built theTemple of Abydos and many other temples. The hall was completed by Seti I's son, Ramesses II. The effects that are produced inside the hall are much different than they were originally. The huge architraves are not above the capitals that tower above. Toward the center of the hall several architraves and windows that have stone latticework still remain. This small area can give one an idea of the builders' intent for the lighting effects. Some imagination is required here to appreciate what it must have looked like. The walls, ceilings and columns are painted with the natural earth tones. The light that was allowed in originally kept most of the hall in shadows. The hall ceiling was 82 feet high and was supported by 12 papyrus columns. The columns are made of sandstone and set in two rows of six. Each row is flanked on either side by 7 rows of columns that are 42 feet (12.8m) high. Each row has 9 columns, however the inner rows have 7 columns. The reliefs throughout the hall contain symbolism of Creation. The reliefs in the northern half are from the time period of Seti I and are obviously better done than those done by his son Ramesses II, which are in the southern half. Ramesses II's reliefs are cut much deeper than those of Seti's. This gives a much more dramatic light and shadow effect. The outer walls of the Hypostyle Hall are covered with scenes of battle. Again, Seti I is to the north and Ramesses II is to the south. The scenes have long since lost their color that was painted and the outlines of the scenes have been blurred by the centuries of wind and sun. It is unsure whether the scenes of battle are based on historical fact or of ritual significance. It is thought that when the battle details are very precise, real events are most likely involved. Seti's battles take place in Lebanon, southern Palestine and Syria. The southern walls of Ramesses II have hieroglyphic texts which actually record details of the Hittite king and Ramesses II signing a peace treaty in the twenty-first year of Ramesses reign. This is the first evidence found for a formal diplomatic agreement and is certainly historical. The Transverse Hall lies beyond the rear wall of the Hypostyle Hall. The wall is mostly ruined. With the Transverse Hall is a partially reconstructed Third Pylon of Amenhotep (Amenophis) III. The Transverse Hall has remains of the earliest sections of the Karnak complex that are still in existence. Leaving the hypostyle hall through the third pylon you come to a narrow court where there once stood several obelisks. One of the obelisks was erected by Tuthmosis I (1504 - 1492 BC) who was the father of Hatshepsut. This obelisk stands 70 feet (21.3m) tall and weighs about 143 tons. During the centuries between Tuthmosis I and Ramesses VI, the kings of the time did more than their share of destroying and dismantling. This obelisk was never touched. The original inscription was left in its place. However, two kings did add their inscription on either side of the original. Beyond this obelisk is the only remaining Obelisk of Hatshepsut (1473-1458 BC). It is 97 feet (29.6m) high and weighs approximately 320 tons. Besides the Lateran obelisk in Rome, this is the tallest standing obelisk. The one in Rome is 101 feet (30.7m) high. Hatshepsut was a woman who dared to challenge the tradition of male kingship. She died from undisclosed causes after imposing her will for a time. After her death, her name and memory suffered attempted systematic obliteration. The inscription on the obelisk says, "O ye people who see this monument in years to come and speak of that which I have made, beware lest you say, 'I know not why it was done'. I did it because I wished to make a gift for my father Amun, and to gild them with electrum." 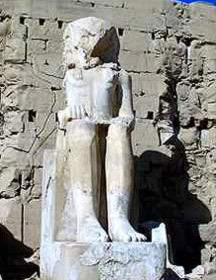 Tuthmosis III (1479-1425 BC) was Hatshepsut's successor. When he came to power, he built a high wall around her obelisk. This wall hid the lower two-thirds but left the upper towering above. It has been thought that this was an easier and cheaper way of destroying her memory than actually tearing it down and removing it. If Tuthmosis III had really wanted to destroy the obelisk, he would have certainly torn it down and removed it. Perhaps that was another reason for his building the wall. The top of the obelisk was visible for 50 miles (80 km). 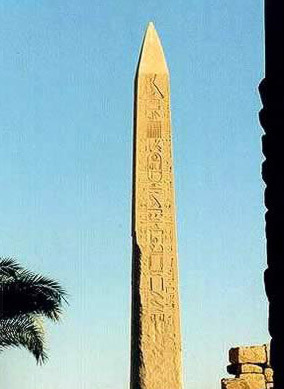 The pink granite for the obelisk was quarried at Aswan, which is several hundred miles south of Karnak. The stone was moved several miles over to the river and shipped down to Thebes. The setting of the stone is shown on reliefs as the pharaoh raising it with a single rope tied to its upper extremity. This is most probably symbolic, but may have been done this way with several hundreds of people pulling together. To the south of the standing obelisk is its companion which has fallen. It was also made of a single block of granite but is broken now. 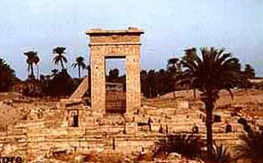 The Sixth Pylon, which was built by Tuthmosis III, leads into a Hall of Records in which the king recorded his tributes. Very little remains of this archive beyond two granite pillars. Just beyond these pillars lies the Holy of Holies or sanctuary. Originally it was the oldest part of the temple. The present sanctuary was built by the brother of Alexander the Great, Philip Arrhidaeus (323-316 BC) who was the King of Macedonia. The present sanctuary was built on the site of the earlier sanctuary built by Tuthmosis III. The present sanctuary contains blocks from the Tuthmosis sanctuary and still contain Tuthmosis' inscriptions. The sanctuary is built in two sections. 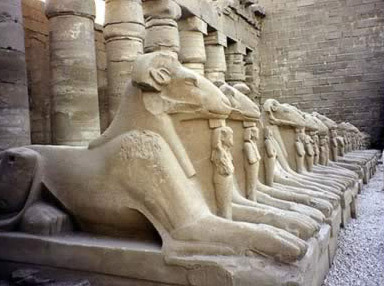 The Karnak Temples are open from 6:30 am until 5:30 pm in winter and from 6 am to 6 pm during summer. Admission is LE 65 for foreigners, LE 35 for foreign students. Visiting the open-air museum, to the left of the second pylon, costs an extra LE 10. The museum contains a collection of statuary that was found throughout the temple complex. The ticket has to be purchased at the main Karnak ticket kiosk. Karnak takes at least a half of a day just to walk around its many precincts and years to come to know it well. There is also a Sound and Light Show at Karnak. The show starts with a historical introduction covering the birth of the great city of Thebes and erection of the Karnak temple. The show also narrates the glorious achievements of some great Pharaohs. The Spectators listen to a magnificent and poetic description of the artistic treasures and great legacy which the Karnak temple encloses.